Playing sports is a great way to keep kids active outdoors during the Summer months. My kids really love kicking a soccer ball around the yard, running outside playing tag, or even setting up an outdoor obstacle course! I thought I would share one of our favorite snacks for game day, or any other time we feel like a bit of spontaneous outdoor active fun. Plus, read below for how you can enter for a chance to win a $100 Visa gift card!! A big thank you to DOLE for sponsoring today’s giveaway and tips to get kids ready for game day! What I love about DOLE Fruit Squish’ems is that they are a super convenient on-the-go snack! If we are on our way to the park for some impromptu soccer practice, I try to have these on-hand because we can grab them on our way out the door for a no fuss no mess snack. Did you know they are free of GMO’s, and they feature BPA-free packaging? I also love that they contain no high fructose corn syrup, or artificial flavors! The squeezable pouches are made with USA apples and they make it so easy for the kids to get an extra serving of healthy fruit. Tip: Freeze the pouches. Defrost for 30-45 minutes for a slushy treat the kids will love! Yumm!! 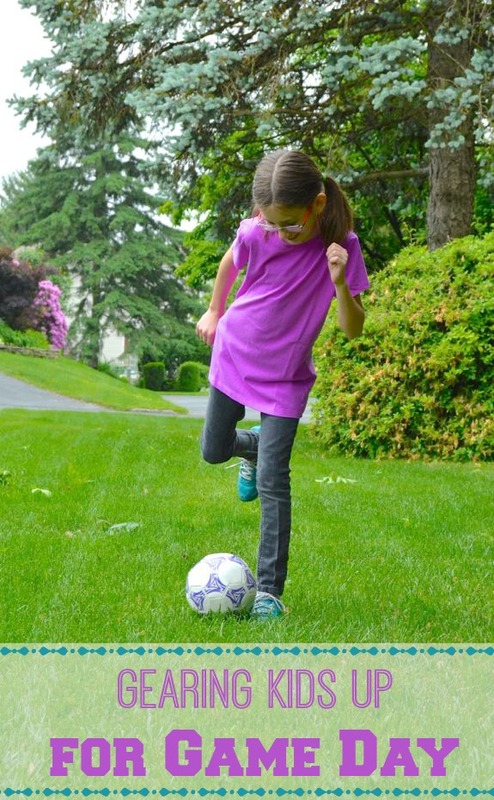 You may also be interested to know that DOLE Fruit Squish’ems has partnered with two-time FIFA Women’s World Cup winner and mom, Brandi Chastain and the American Youth Soccer Organization (AYSO) to help soccer families across the country gear up for game days. DOLE is also sharing plenty of helpful game day tips on their Facebook and Twitter pages throughout the Summer, so be sure to follow them so you don’t miss a thing! 1. Kids learn to be a good sport just as much from the sideline and stands as on the field, so teach them by example to always be respectful to everyone on the field, offer encouragement, and be gracious whether you win or lose. 2. It’s important to be both physically and mentally prepared for game day. I always make sure my son has a good, nutritious meal the night before the game and encourage him to practice visualizing making great plays. When you’ve already imagined them happening, they’re that much easier to recreate on the field! 3. Practice does more than pay off on the field. It teaches us the importance of going out there and earning what we get. So always try to encourage your children and be supportive when they’re putting in that extra effort to practice and improve! 4. It’s easy for things to get lost in the shuffle of crazy game days so always pack extra socks and an extra pair of cleats (if you have them)! 5. Always double check emails and the team website for any last minute schedule changes. It’ll save you time in the long run and who can’t use more of that! 6. When I was playing soccer, nothing got me ready to go like putting on my headphones and listening to my favorite music. Now, my son and I build fun, energetic playlists for the ride to the game. It’s a great way for us to bond and for him to get excited before playing! 7. A tough game means lots of sweat so help your kids by teaching them to stay hydrated! 15-20 oz. of water two to three hours before practices and games will help their little engines to keep running at full steam! 8. It’s no fun losing, but learning how to be a good winner and a good loser are both really important. Before a big game I always try to tell my son that the most important thing is to go out and to do the best you can and win or lose, be positive and treat others with respect. For more game day tips from Brandi, check out her YouTube channel here! Enter the Facebook Game Day Great Contest. Click here to Tweet this message. Leave a comment on this post sharing your best tip to get kids ready for game day! This giveaway is open to US readers only, and the winner will be chosen at random and notified via email. (See official giveaway rules.) Giveaway will close on June 3, 2014 at 6:30pm EST. Good luck!! Entered the contest sharing my tip about the importance of a group huddle before the game!